The School of Human Sciences is composed of departments based on the following three key themes: “environment”, “health and welfare”, and “information”. The three departments are not arranged according to a traditional vertical structure. Students are offered a flexible and interdisciplinary curriculum that crosses departments and academic fields, and which allows them to study from numerous perspectives. What’s more, in addition to allowing students to pursue a balanced blend of learning between the humanities and sciences, we aim to foster human resources with outstanding problem-solving skills and the ability to identify and solve problems on their own initiative. By studying a diverse range of academic fields, the School of Human Sciences allows students to acquire broad knowledge, at the same time as developing highly specialized skills. Examining the question of “environment” with a clear focus on the human perspective In order to address this question, in addition to studying the natural environment we need to totally investigate a variety of relationships between the environment and people. People require a variety of “environments” in the process of living and developing. An interdisciplinary, multi-field approach is used to research the huge range of ecologies, systems, cultures, people, societies, mentalities, and human behavior that make up these “environments”. By their nature, all environments require a focal point. 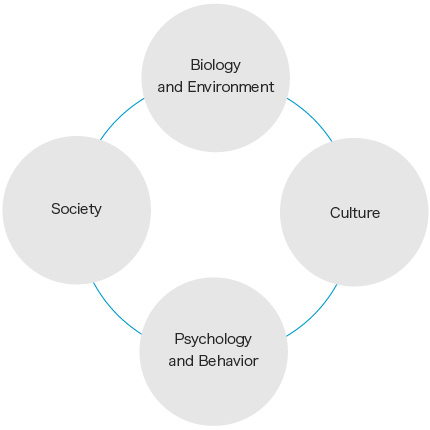 The elements that surround this “core” are what make up the “environment”, and the Department of Human Behavior and Environmental Sciences considers these different “environments” from an open and broad perspective. Our focus is on humanity and human society, but this does not mean we are anthropocentric. What’s more, there is a need to consider environments not only in spatial terms but also across a timespan. For example, geological and archeological approaches are useful in trying to understand how people related to the environment in the past. 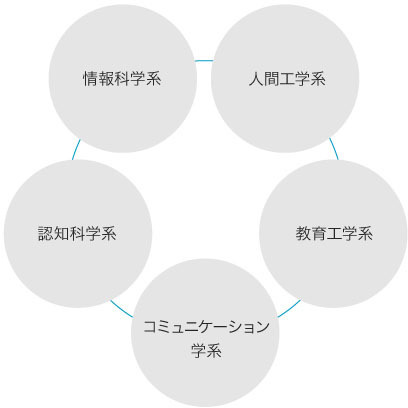 In order to explain the targets of research, the Department has set out four separate research areas (fields): “Biology and Environment, “Society”, “Culture”, and “Psychology and Behavior”. However, there is no need for students and teachers to be limited by these frameworks. They are free to carry out research with a focus on one area, or to study a broad cross-section of different areas. By encouraging students who join the department to acquire new environmental perspectives and work hard alongside our teachers to broaden their knowledge of each field, we aim to build a department that is truly capable of exploring human behavior and environmental science. Students are free to select from numerous environment-related themes and to build their own curriculum. Even if a student took the entrance exam or entered the University in a humanities subject, he or she is able to study the sciences from the basics, and vice versa. It goes without saying that students can takes courses with a focus on humanities or science subjects, and decide a balance between the two that suits them. This is one of the unique characteristics of a human behavior and environmental sciences department that blends the humanities and sciences. The Department also offers foreign language courses in addition to English, such as French, German, Spanish and Chinese. We aim to foster human resources equipped with comprehensive knowledge of the human environment obtained through study with multi-faceted approaches and multiple perspectives, and with the ability to identify and solve problems independently. Students who go on to study at graduate school are able to take study and research into the humanities and sciences of “people and the environment” to the next level. In addition to lecture-based specialist courses, there are compulsory courses in “experimental and survey research methods” and “seminar” courses with a focus on practical experience. Many members of the teaching staff carry out research in environmental, social and cultural fields both in Japan and overseas, and this provides students with opportunities to experience field work. At the same time, students have opportunities to carry out psychological and ethological experiments on campus, to carry out laboratory analyses in the field of biology, and to learn the basics of computer simulations. A variety of research methods are offered to suit both outdoor and indoor types. The Department of Human Behavior and Environmental Sciences is made up of four different research areas. Students research the types of environments in which people, animals and plants live, and questions related to food, agriculture and the environment from different perspectives, such as networks between global resources. Instruction is provided by teachers with expertise in fields such as environment ecology, global ecology, environmental management, environmental geology, behavioral ecology in animals, environmental economics and agricultural economics. Students research a variety of problems related to the social environment in a range of sociological and anthropological fields. This field of research is supported by teachers with specialist knowledge in areas such as family sociology, work sociology, urban sociology, theories of Asian society, social anthropology, demography, and environmental sociology. The environment is studied from the perspectives of archeology, culture and language, and students investigate relationships between people, and the relationships between people and things. Students can tackle a variety of different themes thanks to the diverse lineup of teaching staff, with specialisms in areas such as French culture social theory, German regional culture, Japanese archaeology, cultural anthropology, transcultural pedagogy, history of science, and Spanish area studies. A person’s house, home town, family and local community form his or her “environment”, and students use environmental science to carry out active research into the question of how people’s feelings and behavior are formed and changed within this environment. The teaching staff is composed of specialists in fields such as the psychology of motivation, developmental sociology, environmental psychology, building environmental engineering and architectural design. The Department of Health Sciences and Social Welfare approaches human health and welfare from a variety of different angles. Health and welfare provide the platform for people’s lives. The Department of Health Sciences and Social Welfare provides opportunities for the comprehensive and multilateral study of the social systems, support methods and scientific technologies that allow people to live healthy, safe and fulfilling lives – physically, mentally, and socially. Specifically, the Department provides opportunities to learn in a way that goes beyond the traditional frameworks of “humanities”, “social science” or “natural science”. Fields include medicine, health science, health and welfare-related engineering, clinical psychology, counseling support for people requiring social support, healthcare and welfare systems, and industry. Students at the Department of Health Sciences and Social Welfare select a specific field and research methods in accordance with their goals and interests, and acquire comprehensive learning in related fields with a focus on their chosen specialism. In this way, students are able to acquire knowledge and skills with broad application, while possessing a specialism. This creates opportunities for them to work at companies or at government agencies after graduation, and allows them to work in a broad range of fields as welfare or psychology specialists or as researchers. The Department of Health Sciences and Social Welfare allows students to learn in depth about health and welfare starting out from the areas that interest them, such as thinking about health and welfare through body movement, mental processes, or social relationships. At the same time, they are able to branch out into related fields and achieve broad and multi-layered learning. This includes examining the relationship between the mind and body, considering social support from an engineering perspective and thinking about health from the perspective of social systems. Health and welfare have a direct relationship to human life, and for this reason these fields require theory and practice that can be used in real situations. The Department of Health Sciences and Social Welfare allows students to acquire a practical education (including experiments, production, surveys that measure needs and effects, and practical techniques in counselling and support) and also offers an education that will improve their theory-building skills and their ability to provide scientific and rational explanations, thereby obtaining comprehensive skills in a way that unites theory and practice. To allow students to achieve this learning, the Department of Health Sciences and Social Welfare has appointed teaching staff from a broad range of fields. In addition to teachers specializing in healthcare, physiology, psychology and welfare support technology, the Department has specialist teachers in the fields of engineering and management. So that it can offer a more practical education, it also has teachers with experience on the frontline of healthcare and welfare, and at companies and government agencies. By learning about health and welfare in a multi-faceted way from a diverse range of teachers, students are able to develop into active members of society in possession of specialist skills and a broad perspective. Students are given basic knowledge in health sciences and life and medical sciences so that they can learn systematically about the biological phenomena that are indispensable to healthier living. They learn about the human internal conditions (exercise, nutrition and rest) that support health, and people’s adaptation and behavior in respect to external conditions (the environment), and examine health promotion methods. Students acquire knowledge and skills related to health and welfare and carry out training and research with the goal of achieving human dignity and well-being. There is an emphasis on studying a broad range of fields related to health and welfare and the aim is to train human resources capable of helping people in a wide variety of social settings. 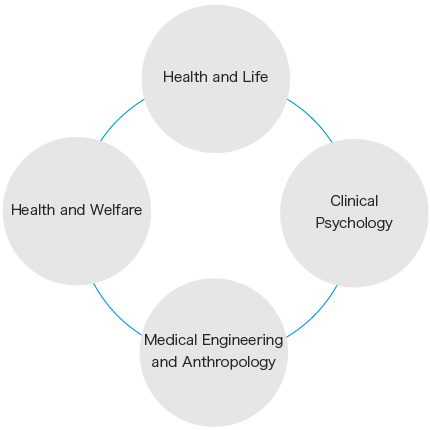 The aim is to foster human resources equipped with the ability to promote and manage clinical workplaces in the fields of health and welfare and its related fields, to carry out research into engineering support based on the relationship between clinical practice and science/technology in order to help people live healthy and fulfilling lives, and to carry out anthropological research in order to solve the many social and cultural problems faced in the clinical workplace. Students carry out education and research with the goal of promoting health and welfare from psychological and ethological perspectives, based on the interaction between individuals and the environment. Students can receive full education and training in order to find work in fields of psychology through which they support people directly (such as clinical psychologist). In particular, we are well-known for possessing one of the best education and research environments in Japan in the field of cognitive and behavior therapy. A variety of information arises in the relationships between people, and the relationships between people and things. We carry out scientific analysis of the processes through which information arises and pursue design that will create rich sources of information. The Department of Human Informatics and Cognitive Sciences does not tackle only computer science. Anything that moves through the interfaces between people and people, and people and things, is deemed to be “information”. The Department of Human Informatics and Cognitive Sciences teaches everything from how to analyze the processes that lead to the creation of this information, through to scientific understanding of how to design systems to create this information. Information is approached from a variety of different perspectives, such as methods for communicating information between people, equipment used as the media for communicating information, and the psychological changes that occur in information. This is then used at the basis for pursuing research. 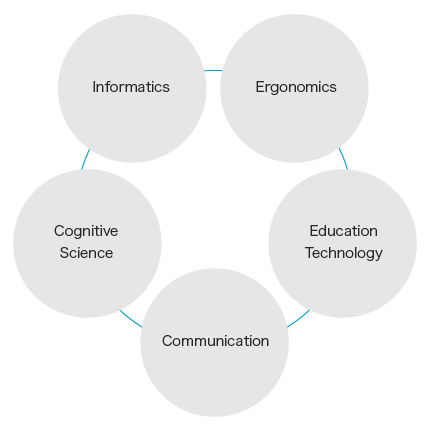 The Department of Human Informatics and Cognitive Sciences is made up of the following five different research areas: Informatics, Cognitive Science, Ergonomics, Education Technology and Communication. In each field, instruction is provided using cutting edge equipment by teachers with practical experience of education and research in the relationships between people and information. The Department also offers many unique educational and research opportunities using a new approach as a human sciences department that combines the three academic fields of engineering, humanities and social science. Students acquire knowledge and skills that will be of use to them in the real world, and they are provided with an attractive environment that allows them to take on challenges in a variety of research themes that anticipate the needs of modern society. Multiple lessons formats are used to teach the diverse range of specialisms. The foundation is provided by lectures and reading, but lessons also include opportunities to carry out experiments with live human subjects in a laboratory, try out hardware and software, learn how to accumulate information in the workplace outside the university, and go on tours of schools overseas. Information is created by allowing people to come into contact with one another. Activities involving people interacting through information are only made possible because these people have been able to meet. This includes playing computer games, meeting up at school or speaking on a mobile phone. These examples may appear unrelated at first, but all of them represent opportunities for people to interact. At the Department of Human Informatics and Cognitive Sciences, in addition to acquiring the knowledge needed to analyze such opportunities, students learn what approaches are needed to design and create new opportunities. At the Department of Human Informatics and Cognitive Sciences, each member of the teaching staff is highly specialized, but the scope of research carried out under the theme of “information” is extremely broad, including fields such as cognition, education, engineering and psychology. Rather than remaining locked within his or her own individual field of research, each teacher carries out research in a way that reaches across other fields. This breadth of interdisciplinary knowledge among the teaching staff creates more interesting and challenging lectures and seminars. All lessons share this characteristic of having “multiple perspectives”, which is the fundamental approach to human science. Students carry out research into themes such as the application of computer science theory to the human sciences, or methods of expression in digital media. They learn a wide range of theory and practice under the instruction of specialist teachers in fields such as information systems, educational informatics, knowledge information science, information and communication sciences, computer science, language and information science and conversational information processing. This research field allows students to research the basic science and applications of information processing in the brain, in relation to the process through which people handle information from their environment and respond accordingly. Instruction is provided by teachers specialized in fields such as the psychology of information processing in humans, color cognitive science, cognitive psychology, ecological psychology, and biological information processing. Students research the points of contact between people and their surrounding environment from the perspective of “human interfaces”, and pursue a vision for controlling information in a way that ensures people’s welfare. Students can pursue a broad range of research interests, under the guidance of teaching staff specialized in fields such as safety ergonomics, biological function analysis and human interfaces. Students carry out research in the field of education with a focus on themes such as how people relate to information as part of the growth process and how this can be utilized, or how internet-based distance learning will change the nature of education. The teaching staff is made up of specialists in fields such as education technology, pedagogical practice, instructional design, and educational information design. This allows students to study “information in education” from an interdisciplinary perspective. This field researches how people use language as “information” to relate to society and the environment. This includes the field of non-verbal communication research. Academic support is provided by teachers who are specialized in fields such as applied linguistics, psychology and ethology, education and media communication research, and educational information communication technologies.